With a little over a century of history behind it, the FCI has a very promising future. I believe in this future, I believe in the FCI and I feel sure that in our hearts we know that, for the FCI, the best is still to come. I have a vision of what the FCI should represent in the future, for every member country, for every breeder, for every competitor and for every dog owner. 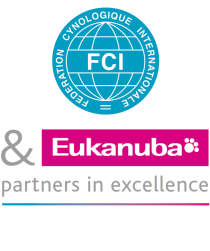 I see the FCI as a frontline organisation, which sets the tone for discussion in the international dog community, with a spirit of openness, in an atmosphere of intellectual dialogue and as a global brand which looks to the best interests of dogs and their owners worldwide. The World Winner competition 2013 in obedience once again showed that there is an increasing interest in obedience training and competing. We could witness a huge number of top performances demonstrating the bond and good relationship between man and dog and the dog’s pleasure to do the required exercises. Twenty nations had sent their representatives to Hungary to this four-day event, including the training day. The maximum number on competitors entered the competition, i.e. one hundred. The competition was held in Gödöllö some 30 kilometres from Budapest. The organising team of the Hungarian kennel club was led by with Adel Slanitz. Organising an event like this means that you are engaged with the job for quite some time, if you want to provide a competition that fulfils all demands. This was done with success. It was also nice to see that Hungary had representation in the championship, probably for the first time. Much of the applied technical know-how of arranging WW obedience competitions came from Austria. Chief steward was Gabriella Pichler, who has been on this job in WW competitions several times before. The judges were Jean Pierre Deplancke from Belgium, John van Hemert from the Netherlands, Svein Georg Rønning from Norway and Erling Olsen from Denmark. The competition was held outdoors, but there was some good luck with the weather. The warm weather had developed a heavy and forever memorable thunderstorm that attacked Gödöllö late one evening and was fortunately gone in by morning. Japan had sent a team for the second time. It was nice to notice their progress from last year. The Czech team also gave us a bit of a surprise when finishing in third place. All in all the performances seem to get better year by year. Ranking the teams and individuals was not the only thing that was done during this four-day event. It was nice to see so much friendship and good sportsmanship among all. It could well be noticed that the dogs were well trained and mannered also outside the ring and one can imagine that obedience dogs are good citizens as well as their owners. Having watched obedience competitions for many years from both inside and outside the ring it has become clear that only happy dogs can succeed in this sport. This should be kept in mind when training. There is a tradition in Hungary that the judges appoint a special prize to the most harmonious couple. On Friday, the prize went to Cini Anna Maria with Erak La Maschera Di Ferro (Malinois) from Italy and on Saturday to Yoko Akagi with Amber of Lune-Forest Layla Jp (Labrador) from Japan. The competition is now over and we look forward to WW 2014 in Helsinki. Thank you to all competitors, judges, all hard workers, the Hungarian canine organisation and the FCI who made this possible.